Still, I pause and evaluate who I am in this moment, what passages I have made to get to now. As I sift through memory and feeling, nothing feels out of place, even the sorrows that are etched on the chambers of my heart. All feels as though it is supposed to be. This is sometimes a hard feeling to resolve myself to, a strange thought for sure. This is because I want for more out of this music that haunts my dreams. I want for more, but right now I feel as though I am exactly where I am supposed to be. Not necessarily where I wanted to be. When I allow myself to follow the rigid downward spirals of self deprecating talk, I compare myself to others and always feel as though I come up short. This is a deceptive manner of thinking, for it only encompasses narrow definitions of success, negating multitudes of other positive ways that my life has been crafted. This all comes to me as I integrate my experiences at Folk Alliance International (a music conference I attended in February) into my repertoire. I must admit, the first two days there were the loneliest days I have had in a long time. I felt keenly out of place, especially as an artist that was not selected to showcase, my experiences not at all compatible with the people I met. More than once I went to the bathroom and cried. I phoned my sister friend on the second day, sobbing, and she asked me to come home, where I was loved and cherished. I couldn't afford to change my tickets, though I desperately wanted to follow her advice, and so resolved myself to making the best of it all. And in that resolution the pain of differentness eased a bit and I went on to experience two much more enriching days, meeting other interesting and unusual souls and coming to the conclusion that it was not my time to showcase and that in actuality, the universe was taking good care of me, as it always has. Had I been chosen to showcase, I would have felt obligated to sing, through a very serious throat infection that has plagued me for 2 months. Most certainly I would not have been my best, through no fault of my own. As I complete another decade of my life, I can see that I lead an unusual life. My experiences do not compare to others, they are unique. I have a life that is rich with beauty and love, and both have been my highest goals for as long as I can remember. Beauty. Love. I could never have foreseen as a child that I would be where I am today so though I have not achieved all that i want with my music yet I can still see that power of what I have already done; in emails that come from people around the world, asking to use my music for dance productions, asking for the use of my music in a school music performance. This is the wonder and intoxication of music; the ability for it to affect people long after its creation. An interview I did in November of 2013 regarding my nomination for a Canadian Folk Music Award for my 2013 album "Scorpion Moon". There were rules, hard edges to cut my words upon. Times to love and times to cry: but what of the tears that run liquid beneath my wanton desire? What place for thoughts that bleed across the lines of timely lucidity? Lost tides, and drift wood words; conversations left parched and wanting. I never wanted to be appropriate, to swallow the streams of conscious creation as Kronos stones, held within my fate-frightened belly. I never wanted to be bound within the rigidity of normal, to tie my tongue with the saccharine noose of niceties. I didn’t want neat lines and ordered phrases carefully wiping away my overflowing dynamism. You didn’t want my messy, but when you cleaned me up, all that was left was the lonely chasm of silence. It is with great gratitude that I announce that I was nominated for a Canadian Folk Music Award in the category of Solo World Artist. It is a quiet sort of victory, being acknowledged for an album that represents a great amount of change and transition in my life. At the same time I want to incessantly blabber on excitedly about the nomination and silently absorb it within, taking a moment to myself to truly come to grips with such an honour. The best part? The awards are being held in Calgary, how serendipitous is that? Can't wait! I am entranced by the trees on my street, the way every quivering leaf seems to have shed the illusions of summer only to reveal the veined light within. I had forgotten how much I love to live on a street shadowed by rows of towering trees, and my gratitude for such remembrance is a welling wave that carries me into each day with cresting happiness. Truly I am satisfied with such small gifts. Light and leaves, wind and water. The autumnal equinox has come and gone, the equal arms of a seasonal cross that spread out to remind me of another year passing. It was almost a year ago that I was in Toronto recording my album, almost a year ago that the unraveling threads of my life were pulled tangled to lay in heaps at my feet. So to walk beneath trees I didn't dream would guard my pensive steps is a reminder of beauty, of the continuance of the heart of the universe. The leaves bring me to thoughts of decay and renewal, such overwhelming beauty is found in the flare of autumn, in what is fundamentally a loss. It feels poignant as I sit and watch the wind dance with the trees. The wind was less poignant yesterday as I sang at the Harvest Festival hosted by the city of Calgary at Ralph Klein Park. I was joined by Aaron Young, who is a spectacular guitarist. The sun was beaming down (so much so I came home with a ridiculously red sunburn on my back), and it seemed the perfect way to welcome autumn. Until of course the wind picked up and teased Aaron relentlessly by playing a games of keep away with his chord charts, but muffling me by blowing hair into my mouth ~laugh~, even going so far as knocking down music stands! Yes it was the kind of gig that keeps you on your toes all right, and offers some interesting variations on chords. Nothing like a little improvised music! Still, the music was sweet and clear in the warm air, and a number of listeners sat eyes closed, while sound and light washed over them. Wonderful! While I sang, a good friend and spectacular visual artist, Liba Labik was creating a beautiful whimsical work. It's not finished yet, as a 2 hour concert didn't quite allow for all the layers Liba wanted to create, but it's off to a good start as you can see below! ~happy sigh~ I love it! It should be finished within the week and will be displayed at the Calgary School of Art in SE Calgary. The air is heavy with the weight of infinite worlds colliding; dreamt into being by the hushed minds of a world sleeping. The sun was a perfect yolk in a deadpan sky this morning, as though offering nothing but itself to the machinations of day. No triumphal pomp of fanfare clouds, nor the confetti of sprinkled light, just the solidarity of what is routine, and what is extraordinary. There was clarity to be found in the simplicity of it all and I turn with fresh face, ready to transition between all the cycling processes that encase me these days. i draw open the curtains to be softly assimilated by light that is not of morning but that rather speaks of transcendent veils of mystery. Veils of light, veils of impermanent place, veils of time and memory which form mysteries that cannot be solved with consuming thoughts, but that rather settle on the skin like so much stardust, invisible, but no less potent. It is that kind of morning, where I look out and see layers of grey filters upon a landscape of white, and it is as if the world is stripping itself of the illusion of colour. The end of a year and the beginning of a new one. The double edged sword of change; loss of the old, anticipation of the new. I have a lot of rebirths in store for me, which means I have had a lot to grieve for in 2012. The latter part of this year has presented me some terrible losses, and so I am eagerly anticipating the beginning of 2013. My CD is being released in just a couple of weeks and I have been holding it as the avatar of hope for my new beginning. With that in mind, it feels poignant to offer you this video blog describing the genesis of the song "Proof of Life", included on the new CD. It's easy to let other people determine our worth, much harder to discern it from within. My love makes me real. It's a beautiful Monday! My dog is sitting beside me taking up MORE than his lion's seat of the chair (in fact I am barely ON my chair, and he is lazed out like a king ~laugh~), I have a bird trying to eat the CDs on my desk (mmm yummy) and I just put together a long overdue video blog with a sneak peak at the first track from my new album! SQUEE! The long nights stretch out as though time were an elastic pulled or released to form the shape of seasons. I am sitting in the studio, trying not to cry. The cello is ripping into me, cracking open all those shells holding the fragile heart in its proper place. It's a warm Toronto day, with that languid air that seems to only happen in humid places. The sun burns a hole through the blue tissue paper sky and the trees quiver in anticipation of the inevitable fall. I am told the maples are changing further north, but that it will be weeks before the colour spreads southwards. It is a perfect autumn day in Calgary, the heat is just a visitor upon day's shore and will retreat with the sun as night lifts from the ground. Don’t you want to drown with time? The concert is called Painted Song. Isn't that a wonderful name for a concert? I am in Edmonton waiting for tomorrow's underwater photo shoot...for which I am unbelievably excited! Vancouver has always seemed to be a laid back city to me. The way the mist lazily clings to the mountains on cool days, even the way the sun comes out on hot ones, sauntering slowly over the horizon, light brimming from all the edges. am tasked with writing a water suite of sorts, for an art installation called "Naiad". The majority of the work must be done in the next few weeks even though the opening isn't until October. Summer is books, is dreaming, is a new album! June is already halfway over and I am still settling into it. The rain breaks the days into pockets of cool and warm such that I am constantly putting on and taking off my sweater. The mist held me in rapture this week, clinging to every corner of the day. It has left me feeling dreamy and otherworldly despite having almost every second of my time scheduled, pushed into tight little nodules. Today though, all is light, and there is a sweetness to the warmth, as though in it I could taste petals yet to come. The Light video! Finally! When I wrote "Light" it was all the words I have desperately wanted to say to all the people I knew who were hurting, to the people who felt lost and broken. So it only seemed appropriate to have a video exploring what other people think the light within them is. The world is not as it was, and we are no longer beholden to the dusty conventions of the past. The forest weeps underfoot, a silent rain as though the world were turned upside down and all the easing melancholy that drips from us could be as a bed to lay on. I have oft thought of tears as a cleansing, something to clear the palette of the weary stones of grief and apologetic insensitivities. I walk and remember my solitude as a place to visit, a place to recall the alpha versions of my now. onths pass as I fall forward in time. It feels that way, as though I am falling forward into tomorrow, rather then stepping forcefully and deliberately. I don't own time, it owns me, marking it's passage on my fingers and face. The night skies have been particularly heart-wrenching lately, from Sirius throwing off dazzling fuchsias, greens and reds, to the moon dripping it's light as though tears from amber eyes. There is something poignant about such light, maybe because it seems so tenuous, so measured, it feels precious to me, small beads of glass hope. So I sit tonight, with my headphones on, listening to music, music that is small in some ways, but that is as those little rips of light in the darkness...aching. Though the sun was a brilliant companion to the day, still this week the groundhog declared that there were to be six more weeks of winter. There is an impermanence to things. The way the light dissolves beyond the day. The way the waves eat the shoreline. The continents are moving beneath our feet, slowly and unfailingly, creating a new world with each passing second. The sun wavers in the January sky, delicately, as though perched precariously on the thin spire of day. There is an intimacy to the sunrise in winter, it rises late, a tousled lover, and sits so companionably low on the horizon, as though facing the day beside rather than from on lofty high. No, it's not like the decadent and overachieving summer sun. This is a sun I relate to, I can tell my secrets to as we lazily start the day together. Sometimes I think all our technology makes us disconnected rather than connected. Winter comes finally. A white cold sheet draping itself haphazardly over trees and lampposts. It is said that to freeze to death is a sort of peace, but I have yet to cross such an abyss and for now it feels more like a soft trembling, the way the flakes spiral downwards, the way that icicles vein across my eyelashes, the way my heart looks out into the lazing drifts and wonders at what ifs and what weres. I have been waiting all this time for winter, for what I know. Though the cold is an ache, still it is normalized, it is what should be. All those months, languishing in the unseasonable warmth, was like breaking up with the seasons and being left hollowed out and waiting to feel something again. As the cold settles like a knowing dream, I sit inside with my tea and watch the world still outside my window. Even the plumes of smoke from the chimneys seems to hover in the air, frigidly held in a kind of stasis. Every year there are at least a few days that are so cold, one can barely contemplate leaving the house and every year they are in January. For the next two weeks (from January 16-30) Cindy and I will be donating 10% of the proceeds from all sales of Wings in Flight to the World Parrot Refuge. Sometimes I think words are such an imperfect vehicle for expression, with their rigid boundaries that never-the-less end up being somewhat fluid in interpretation. In the end, when words are left to stand on their own, without the support of the body, they become harder, encased, in a way, and oh-so-brittle. They become our own vehicles for self-righteousness, we flog ourselves with the words we read in our emails, on our phones, ascribing all our negative thoughts about ourselves to the simple value of each vowel and consonant. As though words actually had no meaning unto themselves and were rather just a narrow binding for emotion. The air shudders with tiny trembling tears and I with it. They say time is a snake endlessly eating itself, but all I can think of is the peeling layers, as though the sky were flaking off, in little thin strips of light. Night rushes in to fill the space the sun has left as it tumbles off the edge of day. I feel as though I am tumbling too, expanding into the darkness, each breath, filling my thoughts out, akin to an expanding balloon. I write as if I could fill it with words, as though I could plaster the terrible renting space with all my clumsily formed presumptions of knowledge. Humans speak a lot. We talk, mash words around, throw them from our mouths as if they were endless in supply. It's easy to forget that our voice has power...power to do good, power to do evil. That words have power. That we can change the world with words if we remember that they have their own energy, synergy, their own potency. It is the winter solstice, the sun standing still in the sky before turning the tides of darkness and letting the light lap once again on day's shore. I am very happy to say that Wings in Flight is finally released. 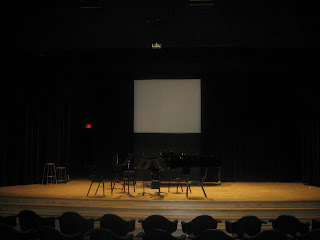 I am very excited about the house concert tonight at the Serenity Performing Arts Center. Catherine and I have set everything up, in the cozy and festive house. It promises to be an enchanting evening. It really doesn't matter how often you test and try things out, there is always something that goes awry. Right now, it's that after Cindy and I tested out the chat for the Wings in Flight chat which is supposed to be happening right now, the chat was closed and I can't get it. Join me and talented singer/songwriter Cindy O'Neil as we chat with fans and media about the upcoming release of our collaborative single, Wings in Flight! A man came up to me last night after my performance, and told me story, a story that filled up all the aching parts of me with beauty and light. This man, a fellow performer and audience member at the Come by the Hills Folk Festival, watched my set at the festival this summer. The day is loosening on the edges, the light all peeled away to reveal the night beneath. Already the solar powered coloured lights on my deck are glowing. do you ever find that first morning after fall back disconcerting? As though the landscape around had shifted and you had lost something in the translation of time and space? Hurrah! I am so excited to have been featured in the Saturday edition of the Calgary Herald last week. What a glory the stars are tonight. Imagine all those suns, some already long gone, lighting up our night sky. Truly it is almost as if we have thousands of suns. Yesterday was such a beautiful day. I am humbled by the media coverage and most of all, Cindy was completely surprised and so thrilled to finally be recording our song! Today I am recording a song that has been 3 years in the making. It has come close to being recorded twice now, but each time circumstance seemed to sidetrack the project. Today though, the circle closes and this song is given its wings. I have finally uploaded a whole bunch of new pictures to my website! Summer lingers into September, like a heady perfume in a darkened room. I am so very excited to announce the release of a collaborative single I did with Danish pianist and composer, Nicky Bendix (www.nickybendix.com). The best part of summer to me is the trees. Not just the leafy bower, nor just the fresh verdancy of the leaves. It's the sound of the leaves as the wind dances within them. All is silent but the sparrow praising the light, pouring his goodness to sky and tree, root and leaf. I still feel so excited when a new review comes my way. This one is from the October 2010 edition of New Age Retailer Magazine. A video from my concert on Friday (The Fates: Song, Story and Myth). Performances are like a dream within a day. You wake from them to realize 6 hours have passed from setup to take down and all that is left is a passing mood, and the echo of music. What I love most about spring is the sound of water. The ice cracking along the river, the gurlged infinity of the spring melt, a sound that tumbles through the air in a lulling rhythm. While I await the first spring crocus, it is that one sound that carries me through April. What a deep and meaningful question "what is the spiritual significance of music?". It was a question I was asked for inclusion in a book about that exact question and one that I had to think about for awhile to come up with a suitable answer. April eases in, as soft as downy moonlight. One day it is winter and then the next I can hear the tumbling sound of water pressing outwards. Occasionally, I feel as if my words have flown. Perhaps migrated to another space for awhile, and I desire to hibernate, to dream a little bit without the doing of writing and composing. I was pretty stoked this morning to get up to an email saying 'Heartwood' was nominated for Best Vocal Album on the Zone Music Reporter. Very awesome! To check out all the nominees visit Zone Music Reporter. When this one cello line was played today in the booth, I was busy bantering with the violinist, and it stopped me so completely I could do nothing but gape while my eyes filled with tears. It just was so heart breaking in it's poignancy. Every song I write, I want to hear recorded. I think that is probably true of all musicians, although maybe not. I know for me, I want to sometimes just be the listener. I love Toronto. I love the brick buildings, the solidness of them, as if they had always been there. I love the vibrancy of it, how the city feels pulsing with energy, a living entity. Every time I come here, I feel creative, blooming inside. It hardly seems possible that tomorrow I am flying to Toronto to mark the beginnings of a new project. This time, it's a small demo with the intent to apply for funding for a full length album, but it's a beginning of sorts, with new songs stepping off the pages of my notebooks and into their own living space. The snow has started to fall, and already it feels a bit like the temperature quietly exiting the room. Looks like January has to have it's last hurrah. Alright, here's a question for you. Who doesn't like world drums? Anyone? BUELLER? I knew it, who could NOT love world drumming? I am sitting on my bed, laptop on lap while the sun wavers through my windows as if diffused through water. The December sun often feels resigned to me as if it tried to climb the steps to the sky and became distracted along the way, stopping to kiss the tops of the trees and the low laying clouds. Often I wish to sit down companionably with my thoughts, to examine where my inspiration is leading. The days recently are so fluid, washing into each other, sweeping through time as a river flooding. There is something I love about being in a creative space, about becoming enraptured in someone else's vision for even just a few moments. That is my hypothesis anyway ~laugh~ See if you agree with me and read about my newest song "Legacy" on Articmist.org. There is something so insular about sleeping through a storm and waking to find the world outside changed. I open dusted eyes to drifts pressed against a window though I did not hear such cold hands creeping in my dreams last night. It's really cool that my song 'The Juniper' made it onto a CD that is included with a new children's book from Prikosnovenie called 'Lullabies and Legends from Broceliande'. 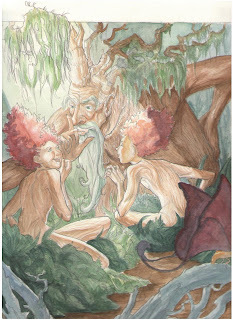 The book can be found on their website http://www.prikosnovenie.com/groupes/lullabies-from-broceliande.html. What I love the most is how the book showcases the beauty of the sun, moon, the quietly turning seasons and the magic found within all such transitions. I am honored to have my song as part of such an enchanting book. I like the light in November. It wavers unassuminging as if it was unaware of its own frail beauty. I am very pleased to say that my song "Legacy" is available to digitally download for 99 cents at CD baby. Check it out at www.cdbaby.com/cd/sora4. Not only am I singing tonight at a fabulous 100 year celebration honouring the Legacy of Calgary Family Services, but was also featured in an article in the Herald today! I could fall in love in autumn. And have a time or two. Something about the sweet luminosity of it, makes me sway into it, swoon into yellows that still hold light and heat, the postcards of summer. The night is companionable right now. The kind of night I find my windows open, so that I can catch the upward drift of shadowed breeze. The kind of night I could let go the coiled time that so easily squeezes and slide instead into a forest walk that knows not form or place. That emptied to a hollow sea? As shadowed cries of you. loosens in opening sheets against the window, a grey backdrop to my dreams. It seems to haunt me after all these weeks, the sound ever so slowly sliding into my skin, a film on my notions of this place. I love this time of year. No matter how desperate I am for each season to arrive, there is a part of me that could live in a Lothlorian autumn forever. The sky chokes with invading smoke from forest fires in British Columbia. I stand on the edge of a lake, a mosaic of Aegean glass and find not relief, but something more primal, the swelling call of water. I have been asked to write a song for an independent short film that deals with the notion of patriotism, through the filter of both America and Ireland. It is the little moments, when that one note is punctuated by leafsong and the wind touches my cheek in shared remembrance that live in and of themselves without the need of past and future. It is the shiver of tumbling chords and the sweet shaped air that passes across my lips as tenderly as ebbed dunes of sand. Pictures from the "Legacy" project. Today smells of summer, of light through leaves, translucent heat. I wake in air saddened by summer's demise. The air in Winnipeg lays upon me, heavy with the lake wrung into into its fibrous veins. A couple of new reviews! yea! I've put a little sample of the reviews here in my blog, the rest can be found in my review section for Heartwood OR by clicking on the links below to see them at their source. Hola from Winnipeg! Trying out a new video blog...more like a video tweet ~laugh~. That just sounds funny ~laugh~. Light Video: I need your help! As the final production work nears completion on my video for "Eurydice" - - I have started planning for my next video for my song "Light". And this time - I want to co-create it with you! fills my dreams and thoughts. Cracked earth, baked day. The molding of self for others, for our own scripts. How fragile my heart, etched by water, shaped by that which I love. Strength within frailty. Elemental, raw, seared into being. I am very excited to be teaming up with McNally Robinson in Winnipeg for a CD signing and preview performance of the Musica Speciale concert "Enchanting Summer" along with John Racaru, Alasdair Dunlop and Jeff Presslaff. A concert dedicated to the late Maureen Forrester featuring original contemporary fusion music by Sora, John Racaru, Jeff Presslaff, Alasdair Dunlop, Mitch Dorge and Tim Butler. The summer has come, burned through the thin paper of spring. A review of Heartwood is up on MuzikReviews. I also have the interview in my "music" section of the site under Heartwood - Reviews. Isn't technology marvelous? I love how I can do an live interview and that day it's already archived on their website. Amazing. The Celts were great story-tellers, their tales almost fairy tale like in their transformative aspects. Come celebrate story in song, magic in notes at the Winnipeg Art Gallery on Saturday night. Featuring myself, Jeff Presslaff (piano), Alasdair Dunlop (bass), Tim Butler (guitar) and John Racaru (violin). are "Sora" and go some way to explaining this eclectic Canadian's music. into new and more personal territory. Huzzah! An interview I did with Pen's Eye View can be found right here. "Heartwood" was recently played on Episode #17 of Atmospheres podcast on Radio Mystic Music. Thanks Pete! Listen to New Age Radio in Germany to hear songs from Heartwood between May 17 and 24. Thanks Erich! 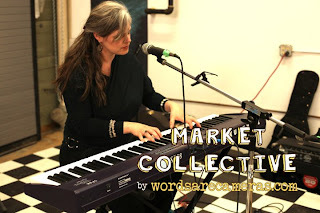 A picture from last weekend at the Market Collective in Kensington. The rain has come, dripping night, sheeted moon. I stare through it, as if to find the words that elude me. I am told to write about legacy, and as such I must find myself in such a thought. Dusk settles in, companionably. I raise my glass to such an old friend and let the ease of silence settle in, a blanket against the spring chill. I write, not to fill the space but to shape its slow beat to my liking. I am very excited for this interview tomorrow on The Gathering Space. It's at 10:00 am MST, which is a delightful time, in my opinion, for an interview. Lately I have been giving a lot of thought to the concept of immortality, a topic that is endlessly examined in our culture, from which star is having botox to maintaining the "body of a 20 year old". Thanks to Dean from the People's Showcase for the interview today. It can be heard here or can be downloaded from their website. I am being interviewed tomorrow on The People's Showcase Radio Show at 6:00pm EST. I have an interview in an hour for The Backstage Gourmet with PJ Grimes. Tune in at 1 pm PST online at HealthyLife.net. There are days I feel I am returning from a half forgotten dream. Every moment an aching to recall what so lightly brushes the footfalls of the mind. Wisp and fragments blurred through the quickly passing scenery. The heart lives only in feeling, and presses its cryptic shapes upon my waking thoughts as delicate and fleeting as winged shadows on snow. Paths melting as the mind warms its touch upon the filaments of past. It seems only stillness can capture the likeness of such unknowing remembrances, for even breath will dissolve the feathery patterns of winter's window into the shifting longing for place and meaning. As if a fragmented dream, the winds suddenly peak between the houses, crests that buffer and scream their indignation. On such forceful lips is snow, heavy as words of passion, coating the flickering light with oblivion. How would you answer this question: What is the spiritual significance of music? A new review of Heartwood can be found at Zeitgeist. Yea! "Sora's newest CD "Heartwood" is a magical and beautiful CD that takes you on a deep earthly journey. The music is mesmerizing and reminds me of being in an old enchanted forest, enjoying the elemental world around me. Sora's voice is also angelic! There are many instrumentals used in this CD including piano, mandolin, cello, violin, drums, accordion, harp and viola. We at "The Faeries and Angels Magazine" highly recommend this enchanting and wonderful CD!" -Adrienne Dumas Editor and Creator of "The Faeries and Angels Magazine"
'Hurricane' was played on Episode 194 of the ArcticMist podcast. The whole podcast is available for download at http://articmist.podomatic.com/. A couple of tracks were featured on the show "Neo-Classical" today on KSPC in Claremont, California. What a cool concept for a show! Neo-Classical, I like it! Light leaves and the leaves remain. Quivering with some unknowable force, or maybe just tricks of eyes and air. They feel like glass, you know, these wild eyes that capture prisms of vernal desire but refuse to hold even a singular secret thought. The air is chilled this morning, as sweet as the last harvest wine. I open the windows just to feel startled out of my complacency, to feel alive. To feel the bumps on my arms raise and the hairs stand up, to feel cold within the this bubble of warm and illusion we create. I watch the birds at my feeder, follow the movements with my eyes and desire to write notes like that, flitting between stillness and movement, between flight and descent. New Radio, New Review, New Podcast! How cool is this...a radio station in Argentina is going to be playing songs from Heartwood! I am pretty excited about it. It's called El Retorno del Gigante. I am pretty excited that Radio SLOR in the Netherlands and Radio Despi in Spain will be playing songs from Heartwood. There is nothing better than finding out someone has spotlighted my album. Especially on a day, like today, that I was feeling somewhat discouraged in the world. Check it out on BaxoJayz's Blog. I was also featured on an all female episode of music on Astral Audio. Look for the "Boom Effect Special"
Some days I wake with words on my lips, that seem to bubble up from some deep recess of dream, a journey forth that leaves me shaken and new, as if such a word was a blossom opening within my mind. Heartwood was played on episode 193 of Articmist podcast. Thanks Jorge! There was something so richly alive about today, from the moment I stepped outside the house into air crisply reveling in the latest snow fall. The trees tonight are made of snow, fragile creations that look as if a single touch would collapse their form into drifting dunes. It is a dreamscape through which I float in seamless wonder. The mist rises, an apparition of the river, haunting my thoughts and clinging to the thin boundary of my skin. Yet it is the trees that hold me, a willing captive to their tenuous beauty. My middle name is Helen..."torchlight" and there has always been some part of me that is fascinated by Helen of Troy. Walking the silent paths of winter, I come across a dogwood, frozen into the stream, so delicately held in stasis, frosted with crystal night. I look behind and see my tracks, the lines of time that mark my passage, overlaying the silent echos of coyote and squirrel. Over the wings in flight, brushed feathers on the snow from which the ghost of flapping wind can be heard and felt. I wonder at how there are no passages that truly are unseen, they all leave their mark somewhere, somehow, a dimming sound that doesn't actually ever end, but vibrates longer and slower into the recesses of time. 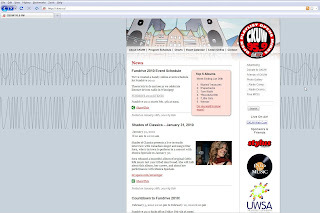 John Iverson sent me this jpeg from the CKUW website...some days this journey is just so amazing. Thanks John! and so the day begins in crystalline beauty. The light emerges slowly from the mist, silently tracking the footfalls of night. I am encapsulated, as the snowflakes cling to branches and posts, so softly, as moonlight, and I as enraptured. It is hard to do anything, when my dreams float through the waking mind, thoughts stretching themselves around the shape of such fleeting filaments of time without time and space without space. I am so energized by last night's rehearsal for the "Fates" concert on Saturday. The acoustics are fantastic there. The first song I sang, I had this thrilling shiver that just rolled up my spine as our 3 voices blended together as if weaving a crystalline vase. Pure.joy. "Heartwood" was played on episode 16 of the Celtic Roots Radio Podcast Thank-you so much Raymond! There is something surreal about flying to a new city, about the leisurely way we take to the air with naught but a roar in our ears to mark the incredible passage. In a way, it is an insular world, where time and distance are but intellectual concepts that do little to assure our senses of the vastness of our passage over sweeping wind sculpted plains, and frozen lakes. I am and have always been glass. A sheer veil of gossamer skin over a heart so transparent. Do you see me? Or through me? Sometimes I look at my thin veins and cannot help but wonder how such frailty withstands the constant pummeling of life. How such frailty contains life. I am glass do I hold against the battering winds with arteries etched of acid tears? Do I shatter when crushed or simply return to the sea in a thousand pieces of memory and time. There are days when beauty feels as if it is the very fiber of my bones, and I worship those days. The world is white. White as a crystalline heart squeezing against the ice that falls from the sky. The only colour is the dogwood bleeding onto the ground. I try to warm myself against the falling night, but cannot seem to find that blush within the grey of day. My chest feels tight, constricted, wanting to breath again in the confines of a bleak January. I am so very excited to be flying to Winnipeg this week to be part of a concert series called Musica Speciale put on by artistic director, John Racaru on Saturday, January 30th! Each frosted tree hanging in stasis, in a quiet that descends as a apparition. From the ground, the air draws deeply to sing the beaded misty shapes into being. It is a note that sounds beyond hearing, that sustains long past the fleeting breath. Even my footsteps, cracking ice on the plains of morning echo as if they are but remembrances of a long lost dream. All is still, and the world folds into a singular space, where the lonely eyes see naught but the white of a morning caught in reverie. 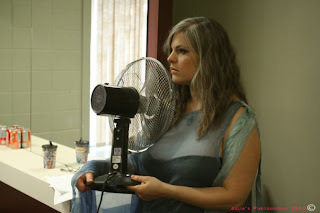 From the last shoot date on the "Eurydice" video. Picture taken by Julia Hornsby. What is that blue? That streaked soul of winter morn, so deeply colored I would swear someone spilled ink across the sky. I cannot get enough of it, I drink of it's richly held secrets, the liquid ether that passes through my fingers as sweetly as the water that springs from the chalice of the earth. And where the fields bleed into night and the lamplight dissolves into the shadows of twilight, the fields of sky are haunted with the ghosts of creatures from the deep, a evanescent light that hovers with such frailty. That morning light is so elusively coy, melting into day beyond my eyes. And yet, it slides back into the bookend of day, and holds the land captive within it's riveting gaze for a moment or two, until it simply dissipates into night. It is the colour of awe. If you haven't heard the album yet (or want to hear it again ~smile~) IRFC Celtic Radio will be playing "Heartwood" in it's entirety on Monday at 5:00 pm PST. IN IT'S ENTIRETY! AND, in the order on the CD ~smile~. How cool is that? Night descends so quickly in the mountains, the light all but running from the looming sentinel of twilight. A last glance, blushed upon the snowy peaks before the enclosed breath chases all thoughts of day into frosted quiet. 'Winter' was featured on the Celtic Shaman Podcast on the Yule 2009 Episode on December 21st. The days feel harried lately, the sun chasing me into the afternoon, a race against it's lateral descent. The solstice presses upon me, the sun barely above the horizon, wearily raising it's head for what feels like moments before laying it down again, with naught but a sigh, within the cradle of winter again. The video shoot was A-MAZ-ING. Two more shoot days in January and then we start post production! I uploaded a whole shwack of photos to my photo section under "Eurydice Video", if you are interested in having a look. The page has to load all the pics before you can navigate it properly, so be patient! The Juniper was featured in Episode 16 of the Woman's Network podcast. Yea! New pictures, new review, new play! There is a new review posted for Heartwood. You can check it out at the source, Zone Music Reporter, or it's under my reviews section. I am totally stoked with this review, he rated it as "excellent"!. Yea! Snow falls and with it silence. Descending quietudes that seem pulled by their own magnitude, by some releasing breath as if autumn had held all it's color and vivaciousness so tightly until this moment. A moment that sighs into being, as easily as a bow unstrung. It is the days of darkness. Not even 4 pm and already there is a stillness to the fading air, to the bleeding light of day. It is the end of November's hush, and we pad on dampened and delicate feet into December's twilight. The snow, so welcome, falling with more vigor now while my eyes make shadows in the fading day. I was so excited to see this! Totally unexpected and completely eeee! "Madron Well" was recently played on Session 27 of Sixty Seven Music Podcast. You can hear the whole show on their website www.sixtysevenmusic.com. Tickets for the concert on Sunday, November 29th are *this* close to being sold out. Yea! So....if you planning on coming down, please go to the Players Ensemble website and buy your ticket before they are all gone. The snow started today, falling through the sun. It was unexpected, carried in within forged anvil clouds that lay siege to the land. Somehow, snow falling while the sun makes prisms in my eyes, is all that much more magical. The mountains are spectacular this morning, crisp pink crests beyond the hollow swirls my breath makes in November's cool well. The sky, flawless, as light bleeds into the gradients of fading twilight. The moon is a secret smile behind the veiled eyes of morning. All I can think is how transient each moment feels, when the difference between morning and night is but a heartbeat, and before my eyes the colours morph and play. Each second I think, THIS is the most perfect moment, until the next is more achingly beautiful, the tonal shades deeper, the feeling within more pristine. How beautiful it is to be alive today. So....my friend, the lovely and talented Lea Hawkins, (who designed the covers of both 'Heartwood' and 'Light') made these pictures, photographed by another of my lovely and talented friends (Tamara Lacelle) into a mock CD cover. Wouldn't that make a cool cover for an album? Lea designs amazing CD covers...truly works of art. 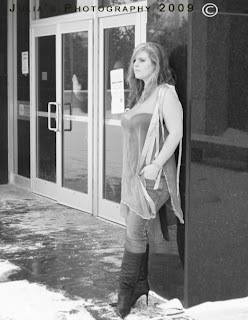 So I am very flattered that she would include this picture of me as part of her album mock ups portfolio. Heartwood on "The Essence Show"
Songs from Heartwood have been added to the playlist on The Essence Show in Brooklyn, NY. The show airs on Sunday mornings and evenings and is hosted by Kara Johnstad. Check out Ed's Mixed Bag , a weekly music podcast on Saturday, November 7 (is it redundant to say 2009? ~laugh~). Today...rocked! I am so very thankful for everyone who is being so generous with their time and talents. Today has been nothing but fun, the whole day seemed to whiz by in a heartbeat. The scene: Orpheus is searching in the underworld for Eurydice, marking her trail. He comes to the river Styx where Charon is waiting. Truly priceless is Charon smoking while waiting for Orpheus. The PERFECT modern touch. It has been a non-autumn. Early snows shocked the trees to brown, and now the leaves sit, wilted vestiges of life, clinging to the branches of their past. I stand outside and though the wind runs tendrils of twilight through my fingers, the leaves rubbing against each other is a dry crackling of paper and sends shivers down my spine. I find it disconcerting, to say the least, and to stare out at the so many trees encased in husky hollows of leaves is...well, just depressing. The in-between is killing me. Feels stilted and it rattles me down to my core. I dream of sand and water. Searing memory that obliterates in a flash of hot light. Who are these caricatures in my mind, these larger than life paradigms of people, whose lucid fingers trace their memory on my skin? How do I escape the confine of my own emotional reality within this dream called life, to know what is in the minds and hearts of others? These thoughts swirl in flaccid sleep and I come over and over to distant shores and scorching memory, to sand and water. It is a delicious reality that this is what my workspace is, a clutter of music, a jumble of instruments. Leaves rattle against the sky, the carcass of summer exposed in all it's raw beauty. I walk through the trees, pillars against my consciousness and find myself again. First Video Shoot on Sunday! Did I mention that we were shooting a video? Orpheus and Eurydice, a story that I cannot seem to get over, is going to be video. YEA! What can I say, but that I am excited to the extreme that 'Eurydice' is going to be a video. I am so amazed at how many fantastic people are donating their time and energy to the project. So fun! The whole script is a modern retelling of the story in which Orpheus is a rock star and Eurydice dies of a drug overdose (how's THAT for a snake?). We Canadians tend towards very little patriotism. For me, I love the land, the spirit of the trees and forests, the great vastness and the wild that sits on the edge of each heartbeat. The wind rushes through me, as elusive as the grains of memory that slide so easily from the ruined hands of time. The chaotic urgency charges something deeply within me, springs forth a restlessness that cannot be satiated even by standing in it's fury, my whipped weeping hair and torn eyes. It is a thread I desperately hold, and try to feel my way back through the knots and tangles towards the beginnings and ends. My thoughts puddled, all in one, none distinguished and so I feel. Stand within the cold lift and feel alive. Saturday is the first video meeting and as I sit in bubbly fantasy I wonder if perhaps I just will never grow up already ~laugh~. I could live in this space, of music, of image and layers of meaning forever. Of creating poetry in motion, poetry in song. Check out this fan video on youtube using 'Winter' to express the unfulfillment of Jo and Laurie's relationship in "Little Women". Children of Lir' was recently played on Celtic Roots Radio - Irish Music Podcast on Episode 10. Thanks so much Raymond! Go check it out and listen to their unique combination of Celtic, folk, folk/rock, Appalachian, Bluegrass, Scottish, Irish, Breton, Cajun, Cape Breton and Singer/songwriter. Such thick heat today, the kind that wraps it's strong legs around, smothering. 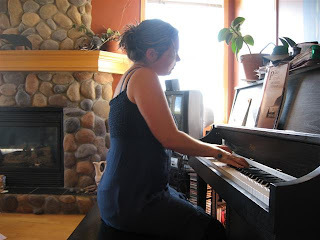 Even in my music room, where the air is usually crisp, raising little goosebumps on my arms, the air was viscous, difficult to breath, pressing on the skin, a leading hand. The light was particularly fragile this morning, diaphanous strands that lay themselves so delicately on the towers of clouds. They dissolve before my eyes, in the heat of my hand, while the sun is a ghost in the sky, pale and bloodless. The morning feels tenuous as if I could run my fingers along the edges of its meniscus and watch it disperse into but a film of time. And I feel that gossamer light as frail as crumbling bones barely but a grazing on my cheeks, while the trees shiver barely covered by the gold of their leaves. Every once and awhile I will read something that just speaks to the plaster that holds my heart together. I will roll the word or phrase around in my mind feeling the contours of its meaning, searching out the nooks and crannies of it's presence. How many afternoons do I sit at my computer, working through the vestments of day, when all of a sudden I can no longer ignore the way my face feels soft in the diffuse light. I can no longer focus, when the pattern of the leaves holds me rapt and the green is so delicate, I cannot help but touch them as gently as a one would handle a piece of gauzy paper. So how awesome is this? My music featured on Quiet Time Podcast today! Thank-you so much Terry for playing my music. I planted roses this summer, a whimsy to me, for I am no gardener, despite my desperate longing to have a green thumb. Still, they grew, but only this week bloomed. To cup them in my hands, to hold their fragrance against me as soft as the tendrils of love, was perfection in a moment. It was joy, in simplicity, beauty opening to itself radiant in the sun. I totally forgot that I won one of the genre contests on ourstage! I am so so so thrilled about it. Further to my thoughts about 2 minutes in my blog about 2 minutes ago, I really was taken by surprise that one of my songs could even win anything. So it was completely unexpected and a really nice boost to my day yesterday to read that. The end of summer stretches out in the languid arms of sumptuous day. While the heat laid it's long body upon the land, I enjoyed letting the light waken me, gently nudging my eyes into wakefulness, the sun already already tracking the moon in the sky as the dreams swirled and formed shapes around me. a pastoral serenity that comes from watching the hovering day exhale from the sleepy hills. In the light that seems to exist within a morning mist, but is simply a thin haze that sighs upwards, held in such fragile stasis for merely moments. I want to find myself in such dewy seconds, when my feet are wet with the condensation night leaves as it's parting gift, a thousand diamonds lavished upon his sweet day. Halycon days, when time seems merely an afterthought. When all that measures the day is the shadows length on the ground and the settling of dusk. Songs from Heartwood will be featured on AM 1060 next Friday (July 31st) from 7pm-8pm. Hope you can have a listen! The summer hovers in the air, a sigh, while the sun settles into a hum of contentment on the western horizon. Time always seems to stand still on such an evening, and I am surprised when the darkness finally overtakes the day, as if I was living in that golden twilight for an eternity in a moment. We drove through the twilight last night home from Pembina River Nights. This morning I awoke to realize I left my voice in Pembina! Ahh, the joys of laryngitis. Songs from Heartwood will be featured this week on the CBC radio 1 show, "Key of A", on Saturday July 11th form 5-6 pm. I hope you will tune in and have a listen. 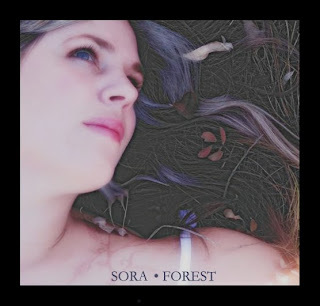 "Once in a while, you experience something very special when listening to a new album, one such album is the latest offering from Calgary-based Sora, titled ‘Heartwood’. The days seem to melt so easily into the sun, the hours quietly counting in the shadows until the wind draws in the restless night. Each night I watch the trees swaying into the droplets that dance in the arms of the summer storms. It is an uneasy balance that is scarcely seen of felt in the still of the dawn. Check me out under the roots section! Currently #4 on CFBX 92.5 FM in Kamloops. But oh, those grasses, a smell that truly is summer to me. Forget the smell of cut grass, it is but a poor feast for the senses, when what I long for is the symphony of sweet buffalo grass. New Radio Stations & Charting! Prairie Ceilidh has been playing a lot of my songs lately, which is fantastic! Thanks Lyle! I saw the first wild rose flower today, it was startling to me in it's vividness, in the sheer power of it's simplicity. Below is the review by John Iverson that appeared in Stylus Magazine. Yea! Just a quick note to say that I am singing on Friday at an eclectic recital this Friday (12th) at Scarboro United Church. Heartwood is being featured on Shades of Classics on Sunday, June 7th. The show can be heard live between 8 and 10 am Central time or you can download the show later on that day. Just thought I would mention that Russ has been playing my music on Radio Liberte in France. I got an email not too long ago that he was playing Eurydice (good choice ~smile~). I left a dreary Calgary indeed last week. The flowers were but a hint on the wind and the leaves newborn. I came back to the crapapples in bloom, with their stunning pink blossoms that seem so replete, so heavy in fertile dreams, that it is a wonder how the branches support their sumptuousness. I stood today and gave myself to looking out the window for a few moments, while the clouds churned in the sky and the day was sleepily awakening from its night reveries. I am SO thrilled about all the positive response to my CD. Wow. I am so thrilled that the following radio stations have put my songs in rotation. For the most part, 'Light' is the one that is being put in rotation, but feel free to request any of my songs if you listen to these stations! Check out my phone interview with Banana Peel Radio . There are TWO new reviews up for Heartwood. 4 out of 5 stars and 5 out of 5 stars....woohoo!!!!! All day I have wanted to sit and find the words to synthesize my CD release last night. After such a huge event, my favorite time is actually after the last guest has left, when there is a chaos of half empty plates, strewn wine glasses and fading stage lights. When the candles are burned down to the quick and I can take off my shoes, sit back with a glass of wine and just breath in the night, as if all of it were contained in that funnel of smoke that spirals so lazily into the sky from the blown out tealight. "Were those angels in the studio today or was it just Sora? It was Sora singing a lovely song!" Well, I am pretty stoked to say that I will be on BT tomorrow morning. For those of you NOT in Calgary, BT (or Breakfast Television) is a CityTV show that airs every weekday starting at 6 am. Just thought I would mention that I will be online on my website chat from 8pm - 10pm MST. And now, time slips away again, and though I wish to sit here with my fingers typing the songs of the birds that trill outside my window, there is no time for dreams this week, as I move into my CD release. For any of you in Germany, Folkland radio (www.folklandradio.de) will be playing some songs from Heartwood on a Sunday radioshow at 20h (GMT+1). Yea! I uploaded a new video blog of Children of Lir today, you may need to refresh a few times for the page to catch it. It's on my facebook and myspace as well :). I practice, knowing that my fingers need to retrace the paths and chords of such familiar songs to me, but my heart is singing in weird parallels, new notes, new words while my fingers ache to map the shape of my longings. ... I was calling it "Love song" for AGES, not because I thought that was a good title. NO, I had the good sense to know it was a horrific title, but because I could not for the life of me come up with a better title. Snow blows across my vision and the world is white once more. Seems spring is stuck in that same waiting place as I am. Spring cracks open, the sun as bright as a yolk in the sky. The streets are filled with pools of light. Liquid gold phasing through the morning breath, that perfect moment between yesterday and tomorrow. I watch the seasons changing, feel each sunrise deep in the marrow of my bones, and gather my strength around me, a mantle of light. breaks, shattering the clouds into a thousand pinpricks of light. Snow lightly touches my face, the gossamer wings of winter so effortlessly flying away. Words are spiraling through my mind, notes carried on the breath of emotion. I feel the release building as I spin in the morning light. my fingers play the color of the roses, the notes aching with unspoken desire, my violin singing the shades of my being, giving shape to the sweet perfume of crimson, blushing topaz and buttery gold. Spring seems to crack itself out of winter, the icy cocoon of languid dreams splitting open to reveal the breath of vernal longings within. I have been inside way to much this last month, either busy with practicing and the million little things that always seem to need being done, or sick. I feel the absence of the living sky fiercely, I feel the memory of trees pulling me to sit within their shelter and just listen to nothing but the stretching of the branches as the sap starts to flow again within. There is something magical to me about the winter twilight, when that deep indigo blue seems to pierce into the very fiber of my being. Slowly I come back from that tired sickness of the last few weeks. Slowly the day warms itself on my skin, and I feel as if I am expanding out of myself, deep breaths that loosen my consciousness and rattle the edges of my being. Be warned, it involves a lot of stories and general nonsense from me, and many many spoiler songs from my album. The light filters through the transparency of my eyelids, such that while I play, the sound mingles into the crimson warmth as I cannot help but turn to such hope and beauty. It is days like today, when sunrise is a crest of light washing upon my shore, and the moon burns brightly in the pink haze of western clouds hanging so precariously above the snowy mountains that I feel the most myself. The clouds are churning up snow today. Swirling within this smudged billowing nebula, that sits in the forefront of the sky. I wish everyone could have seen the sky this morning here. The morning steals in, dove grey light filtering through my soft eyes. The tides of day come, rushing to fill the cavern of night dreams. I am going to be interviewed LIVE on the CKUW show Shades of Classics next Sunday (January 31st). The show runs from 8am-10am Central time and I am going to be on at 9:20am. I am pretty stoked about it, so I hope you will listen in. It is with complete indulgence that I am writing this from Lacquer Channel right in the middle of the mystical mastering sessions. It was sad to leave the studio today, knowing that I will not be back (at least not for some time). I had that bizarre sense of loss, of goodbye, the kind that chokes in your throat and swells in the eyes. I'm in the studio...right now! The last leg of the journey, the final touches and tweaks. It is surreal to be in Toronto again. I feel as if today has been a blur, from arriving in the early afternoon, straight to the studio, to this moment now, when finally I can absorb that I am actually in Toronto. That I am here, while the humid air seeps through me, chilling to the bone and the music sings in my veins. Usually getting up before the sun is abhorrent to me, sleep sitting behind my eyes and the morning darkness a call to climb back into my bed and fall weightfully into the dreams that so pleasantly surrounded me just moments before. The string tracks have been laid, and in just a few days I will be in Toronto finishing this CD. I am so excited to hear the final project, but it is not without a small amount of trepidation that I complete this last leg and move forward into the pressing. "Twilght" was featured on the Best of 2009 Podcast (#76) by Marc Gunn! Yea! I am sitting here trying to find the words for the CD booklet and they frustratingly elude me. I have at one time too much to say and not enough. How can that be? I sit. The dove grey light is peaceful, as if it were a sea of air, still and deep around me. There are some things in life you are destined to get addicted to after trying....chocolate....tattoos....recording. Staring up into the blanketed sky and beauty sits in the palm in my hand. I love the red winter sun, the way it shimmers into existence from the arcane night sky. I can never find a good word to describe its color, as if the tangerine light was the beginning of any such definition. I watch it move across the walls, searching for the contours of my face and want to give myself to it completely. Just that one moment, as it crests the tenuous horizon, as if a life was born, lived and died all caught within the wavering slender light of winter's morn. The lights are off, and the absence of it echos into the silence. Currents of words rushing, as if to fill the space the day leaves as it fades from my eyes. It is always this way, when the frenzy of daylight pulls away like the tide from the shore, I sink again into the deep sea of night, floating through the waking dream. 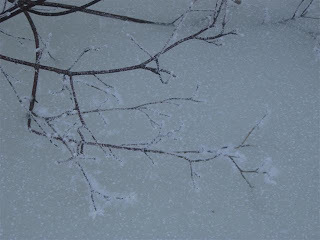 Winter sits within me this week, icy tendrils snaking through. I carry it with me, softening the day, sharp at night, while dreams fall like snow through my mind, melting away on impact. I peer through the icescapes, as if I could see my beating heart, but all seems distant, far away...unknowable. Even the music is a far away tinkling, an underwater creek, hidden beneath the slumbering drifts of thought. I find this lucid moments of clarity when words bubble up from my throat, only to die on my pen. The morning is coated in ice, cracking open the reverie of winter. The air is sharp, each breath balanced on crystalline pins. Snow hangs in the air, softening the edges of day, a dreamy counterpoint to the icy glass hanging from trees and crunching beneath my feet. It feels as if winter has come, it stings my cheeks and sings in my blood. There has been a quietness to my being these last few days, a softening of my thoughts, and a sadness that I cannot seem to banish from my eyes. How sensuous was the wind tonight, a twining serpent moving over my body. How quiet the air felt, still beneath the fluttering movements that ripple along my the edges of my pjs, that graze my hair. It is remembrance day in Canada, the time to remember old wars and wounds, to remember the price of freedom. The day dawned slowly, manifesting from dreams where music layered through anxiety to create discordant chords and visions in my mind. The light easing me out, as one sloughs off tight clothing at the end of the day. Winter has come in the indigo November night. Tonight as the darkness so quickly stole upon me, I could feel the chill moving across my body, as if I were acknowledging in some secret part of myself that winter is here. There is a feeling that comes with the first snowfall, a deep stillness as if the world has stopped spinning for a moment. Or maybe it is instead as if I am spinning in perfect synchronicity, the moment, a shared breath, eyes locked on the core. I have never found the words to perfectly express that feeling that exists in the chill dark morning, when the world hovers between the seasons. When the air is a cool cloth on the skin, tempering the warmth that spreads like brandy through the arteries of life. I have sat so many times as the grainy indigo evaporates into the morning, have looked up as if I could see the wind, as if the sky held the words I so longed to pour onto the paper, like liquid fire. This morning, it rests so quietly upon me, this nameless feeling, that I am loathe to give to the light. And through each movement I hear music, as if my day has synchronized itself to the secret longing of the song. And so I sit here in a darkened room, with the haze of sleep heavy upon it, in Edmonton of all places. There is a feeling, when people sleep, a heaviness upon the space, as if time is indeed grains of sand. Time seems to sit suspended in the air, and I can feel the sleep all around me as if it were a physical substance in the air. The night presses upon me, how rarely I am here at my computer writing words, and yet, as the daylight gives way to the relentless tides of night I cannot help but to hear whispers within the deep well of darkness as it cocoons around me. It has always been this way for me, as the night insulates my world, I feel my mind expanding out as it were questing for others, I feel myself expanding, as if the form of my body was but ribbons in the wind, free to flutter where the mind takes it. Tonight I sit and ponder on the inter-connections we make, how distance can be such an illusion. The autumn rains are falling, so softly, and yet the sun shines upon my eyes, weaker already, white as it falls into the western mountains. The days, the flow so sweetly into each other, so swiftly, with naught but the flicker of light between them. I feel restless, desire for something that seems unnamed. I am longing for something that eludes me, and so I dance with day and night, feeling calm only within the twilight, in the spaces in between. Do you ever sit and look out the window at the grey sky and just think to yourself...I don't have enough time. Time...that rhythm that seems to bring form to the day, as if it were the very fabric of reality made up of universal heartbeats. It is the space between that I am interested in, the place where all can be and yet nothing is. The place where the limitations so cooly placed, float away as if a fragment of a dream. Yet some days it is difficult to listen for that silence. For the space in between. I am thinking of a new song, one the slides down through passing chords, as water over the rocks of time. There are images pressing upon my mind, the feeling of it expanding within my body as if form were not an obstacle. I am struck by the image of Arwen, of twilight and the evening star falling, falling. As the day envelopes the lingering notes of night's reverie, that ethereal feeling, tendrils of connection, seem to snap back into the body, evaporating like morning mist. So I write, to preserve what is left, to let these shadowy forms take shape. Do I write the songs or do they write me? Words seem to be constant companions in my head as the days pass through me. Some days I am narrating to myself, other times odd phrases will pop up, placed as though written by another's hand. Reminds me a bit of the Griffin and Sabine books at times. Light' will be played on the Celtic podshow this weekend! Thank-you Gary and Ruth! Do all good things have to come to an end? Or is it better to think about all endings as new beginnings? My vocals are done, unless we get more funding and then even still, I think my vocals are pretty much done. This journey I started almost 2 years ago, is wrapping up, for me anyway. That seems like a silly thing to say considering that having the actual CD is just the beginning, but the creation part is just about done, and that is the journey I have been so focused on over the last 2 years. Hurricane...the leads are finished! I sang more than I thought I could and the sound was so different from anything I have ever done. Breathy, angry, full of angst and pain. In a way I can't believe that I did it, that I could take it even partially where it needed to go. It has weighed on my mind since the June recordings, I worried that I would just fall into my old bad singing habits and not be able to pull myself into the space I needed. Whose CD is this anyway? ~laughing~ Well, as per usual, I have few pictures of me actually singing in session, but I DO have one of Doug adding some masculine layering to the sound. So voila! This is how I love to spend a morning as the sun rises, with the colors of the wind in my ears and my fingers on the keys. Another day of recording, I cannot wait! I am back in the studio today. I can't believe it! The time between the June recordings and now has flown by at an impossible rate and it feels like just yesterday that I was in Toronto. In a way I am not ready for these dates, not ready to finish the vocals for now, not ready to be done with my part of the recording. The day dawns clear and bright, and already the heat is rising from the fecundant green hills. Each blade of grass carries the scent of memories to me, somehow the summer evokes more emotion, more deeply held visions of younger me's. Already I feel the fleeting passage of time as the days run by each other, as water over stones. Why is it that at the height of growth and lush richness, there is always the hint of decay carried in the heat of the day? Like shadows in the wall, hues of yesterday dappling through the now, promising for tomorrow. I feel the need to slow down, to lay myself within summer, drinking her sweetness. I was played on 'Irish Ways Programme' last night, which is a radio show on Flagler College Radio WFCF 88.5 fm in St. Augustine, Florida. Keep an ear out on the show for more of my music! Thank-you William! How can anyone resist the allure of the blog? I know I can't for long hehe. I have been so very fortunate on this journey to meet the nicest people, with such talent. I have come a long way from my intrepid beginnings into song, walking upon that proverbial thorned path, to the now which is just blooming roses! You can now by my new EP on CDbaby and on Kerf Music. I was just added to the recommended list on HappyDay New Age Radio in South Korea! How about that?! The day ended in the studio, in that exact booth, singing my songs. It felt, just amazing. I worked hard but it felt almost effortless, with Doug directing the sound, helping me to create the space these songs inhabit. 15 hours in the studio yesterday...15! But, saying that, Oh.my.gods. Wow. Fergus Marsh came in first to lay down some electric bass and chapman stick. Crazy talented! Then Sharlene Wallace brought her harp, and just added this beautiful melodic aspect to the songs, and finally Ray Dillard brought an arsenal of percussive instruments and blew our minds. Yes, that was nonsensical...you had to be there ~laugh~ IBM was the culprit behind the wireless issues. Now that IBM is gone, wireless is my happy friend. I know, I know that was SO cliche, but I just can't help myself. I have mentioned before that my life consists of a series of songs haven't I? At any given moment there is a song running in my brain, complete with real lyrics or if not, lyrics that I happen to make up at the time. I did mention that I am no poet, so these made-up lyrics tend towards the inane, but I like to give voice to the song regardless hehe. Is a week a long time? The Juniper is going to be played on "World Calling" show on Radio Liberte in France on May 29th at 22:00. Thanks Russ! My EP! It's here! I am so excited about it. You can check it out on the music page, or you can buy it from the store. In other news I am getting radio play on Bishop FM. I think I am scheduled to play on June 9th in the evening, so have a listen and support indie music! I am going to be played on the Kingston Radio Program "Salt Water Music" CFRC 101.9 FM on May 19th between 10pm and 11pm EST. This show is also live streamed from their website if you don't live in the Kingston area www.cfrc.ca. Thanks so much Rob! There was a stillness within the halls of my mind this weekend, quietude that felt thick with it's own existence. I did an interview with Jeffrey Rubin of Banana Peel Radio on Thursday night. To hear it please go to Banana Peel Radio! The EP is officially at press and will be available by the end of March! Please email me if you want to be on my mailing list and be the FIRST to know. It is cold. Colder than it has been in years, and I find myself introspective as the frost makes its patterns upon my window and the cold air is a knife within my lungs.There isn't much snow, the streets are covered, and slick with frozen tire tracks, but the ravine is spotted with snow, the tan corpses of grasses scattered about. There is a stillness in such cold even the little birds that normally lend their happy songs to the winter morning are gone. It is as if the world is sleeping, and I wonder what is sleeping within me. Come and hear myself, Cindy O'Neil and Ashley Coe at the Nikkei Cultural Center on February 15! We are calling it a Living Room Concert...no, it's not in a living room, but it feels like a living room, with couches and beverages and art. You can even bring your own wine or beer! I am singing with a fabulous harpist named Joanne Meis, so it is going to be a great show. I only get 20 tickets....20! So if you want to come, please email me pronto sora@soramusic.ca and I will arrange to get you one. Tickets are $10. I am flying to Toronto in a couple of weeks (WEEEE!) to record some more demos. The summer has passed so quickly, the golden grasses already giving up their seeds, the thistles cottony fluff aflight. Check out the scatch demo's on my Music page!